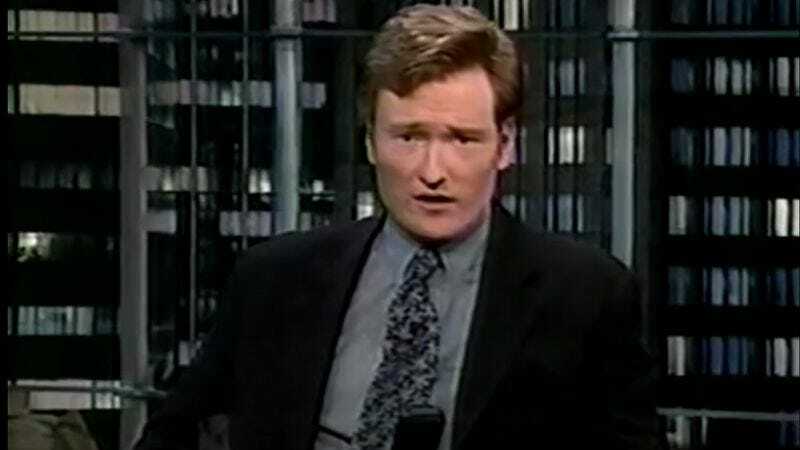 Today, Conan O’Brien is an elder statesman of late night television, with over two decades in the game. But when his NBC gabfest, Late Night With Conan O’Brien, debuted back in September 1993, the lanky redhead was a decidedly untested commodity. Apart from some brief appearances on Saturday Night Live, O’Brien had little experience as an on-air performer. But he soon developed a quirky persona all his own. Kliph Nesteroff, showbiz historian and author of The Comedians, aims to take viewers back to those rocky, early days of O’Brien’s career. Nesteroff tweeted a link to an incredible incredible playlist of vintage Late Night With Conan O’Brien episodes, all posted from the account of Derek Beaupre. Here, in one place, are dozens of shows from O’Brien’s halcyon days at NBC, before his relationship with the network turned sour. For anyone who longs for a time when Max Weinberg was still O’Brien’s bandleader or when Robert Smigel’s goofy “Syncro-Vox” sketches were still a staple of the show, this playlist is a godsend. Fans who haven’t revisited Late Night With Conan O’Brien since it ended in 2009 will find that this playlist brings back a lot of memories. Remember Carl “Oldy” Olsen, the impossibly ancient recurring character played by William Preston? He’s here. And what about “If They Mated,” the segment in which O’Brien showed the hideous potential offspring of celebrity couples? That’s here, too. Maybe more than any network talk show before or since, O’Brien’s Late Night was a storehouse of absurdist meta-comedy, lampooning the tropes of the genre. But there’s plenty of conventional, once-topical, now-dated humor here, too, including jokes about Whitewater and Monica Lewinsky. Above all, this playlist is a gift for ’90s nostalgia addicts. What could be a better time capsule of that era than an episode featuring Janeane Garofalo and Buster Poindexter? That’s the decade in a nutshell.